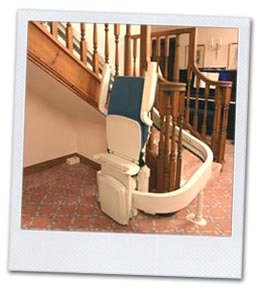 A curved stairlift is required for a staircase which has a bend(s) or a landing part way up. The curve anything - from a gentle 45 degree turn to a full spiral staircase curve! The curved stairlifts we provide offer complete versatility. They are designed to tackle practically any staircase regardless of the shape and length, and offer exactly the same level of comfort you'd expect from a straight stairlift. Safety key, to prevent miduse / accidental use. Folding arms, seat and footrest - which is often required for smaller staircases to save room. Safety cut-out sensors - stopping the stairlift if something gets into its path. Diagnostic digital display - in the event of a rare fault with your stairlift, a code is displayed that can be given to customer support to analyse the problem instantly. Dual electronic and mechanical braking systems for extra safety. Over speed governor controls the speed of the stairlift to prevent sudden or rapid descend. Swivel seat, for ease of mounting / dismounting the stairlift. Battery powered ensuring continual use - even in the event of a powercut! New / refurbished / reconditioned to offer you a choice, and the best possible value!